For the very first time, a WSU research team has developed a promising method that will help recycle the popular carbon fiber plastics used in everything from sporting goods and modern airplanes to the wind energy industry. Reported in Polymer Degradation and Stability, the work presents an effective way to re-use the costly carbon fiber and other materials that make up the composites. Carbon fiber reinforced plastics are greatly popular in several industries, especially aviation, as they are strong and light. They are, however, extremely difficult to recycle or break down, and disposing of them has indeed become an increasing concern. While thermoplastics, the particular type of plastic used in milk bottles, can be melted and effortlessly re-used, several composites used in planes are thermosets. These types of plastics are cured and cannot easily be undone and returned to their original materials. 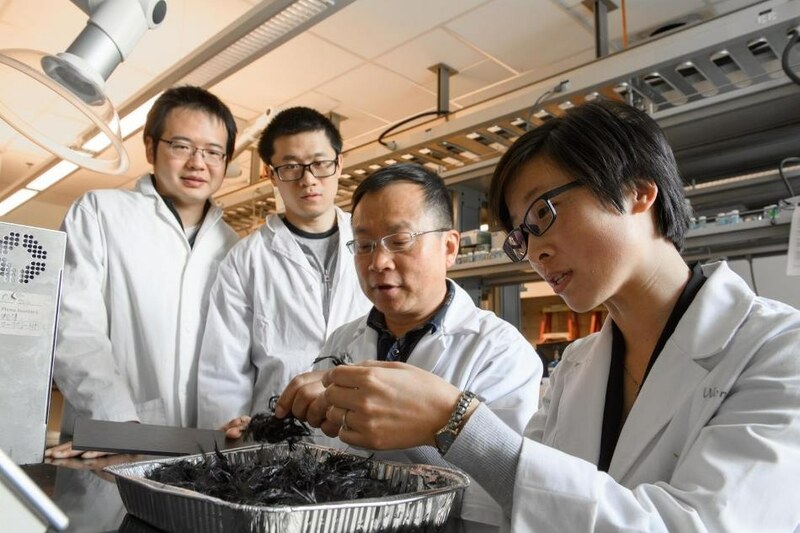 To recycle them, researchers mostly have attempted to grind them down mechanically or break them down with extremely high temperatures or strong chemicals in order to recover the expensive carbon fiber. However, the carbon fiber is damaged in the process very frequently. The caustic chemicals used are hazardous and cannot be easily disposed. They also destroy the matrix resin materials in the composites, producing a messy mixture of chemicals and an additional waste problem. In their project, Jinwen Zhang, a professor in the School of Mechanical and Materials Engineering, and his team broke down the thermosets by using a new chemical recycling method that used mild acids as catalysts in liquid ethanol at a relatively low temperature. In particular, it was the combination of chemicals that proved to be effective, said Zhang, who has a chemistry background. The researchers were able to break down cured materials effectively by raising the temperature of the material so that the catalyst-containing liquid will be able penetrate into the composite and break down the complex structure. Zhang used zinc chloride to break down critical carbon-nitrogen bonds and ethanol to make the resins expand. It is critical to develop efficient catalytic systems that are capable of permeating into the cured resins and breaking down the chemical bonds of cured resins. The researchers succeeded in preserving the carbon fibers as well as the resin material in a useful form that could be effortlessly re-used. A patent has been filed and the researchers are now working to commercialize their methods. The Joint Center for Aerospace Technology Innovation (JCATI) in collaboration with industry partner, Global Fiberglass Solutions funded the work. The state-funded JCATI works to support the Washington’s aerospace industry by pursuing research that is related to aerospace companies and also by providing industry-focused research opportunities. In addition to Zhang, researchers on the project included Junna Xin, assistant research professor, Tuan Liu, postdoctoral research associate, and graduate student Xiaolong Guo. The research is in keeping with WSU’s Grand Challenges initiative stimulating research that addresses some of society’s most complicated issues. It is specifically relevant to the challenge of “Smart Systems” and its theme of foundational and emergent materials.